Triple bill featuring the original 1989 film along with the 2000 sequel and 2008 prequel. 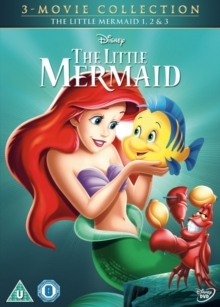 In 'The Little Mermaid' (1989), Ariel (voice of Jodi Benson) is the mermaid daughter of King Triton (voice of Kenneth Mars), and lives beneath the waves. However, Ariel longs to see the world above, especially after rescuing a handsome prince from drowning. To this end she makes a deal with sea witch Ursula (voice of Pat Carroll) to live above the sea in exchange for her beautiful singing voice. Ariel soon regrets her decision, however, when it transpires that her father's kingdom is at risk. In 'The Little Mermaid II - Return to the Sea' (2000), Ariel (voice of Benson) and Eric (voice of Rob Paulsen) have had a baby daughter, Melody (voice of Tara Strong), but the threat of reprisal from Ursula's sister Morgana (voice of Carroll) means that they must keep the girl in the dark about her mermaid heritage. To set things right, Ariel must team up with her old chums Sebastian (voice of Samuel E.
Wright), Flounder (Cam Clarke) and Scuttle (voice of Buddy Hackett) and embark upon a daring rescue mission. Finally, in 'The Little Mermaid - Ariel's Beginning' (2008), Ariel (voice of Benson) finds herself torn between her love of music and her family duty. With the help of her friends, Sebastian (voice of Wright) and Flounder (voice of Parker Goris), and her six sisters, Ariel sets about to try and restore music, friendship and love to the Kingdom of Atlantica.